Every Soul EV that has gone to Arizona has suffered severe battery degradation. There is an old thread about this. My advice. Do not buy a Soul EV in Arizona. I had read that thread before purchasing. I do not regret buying a Soul EV in Arizona. 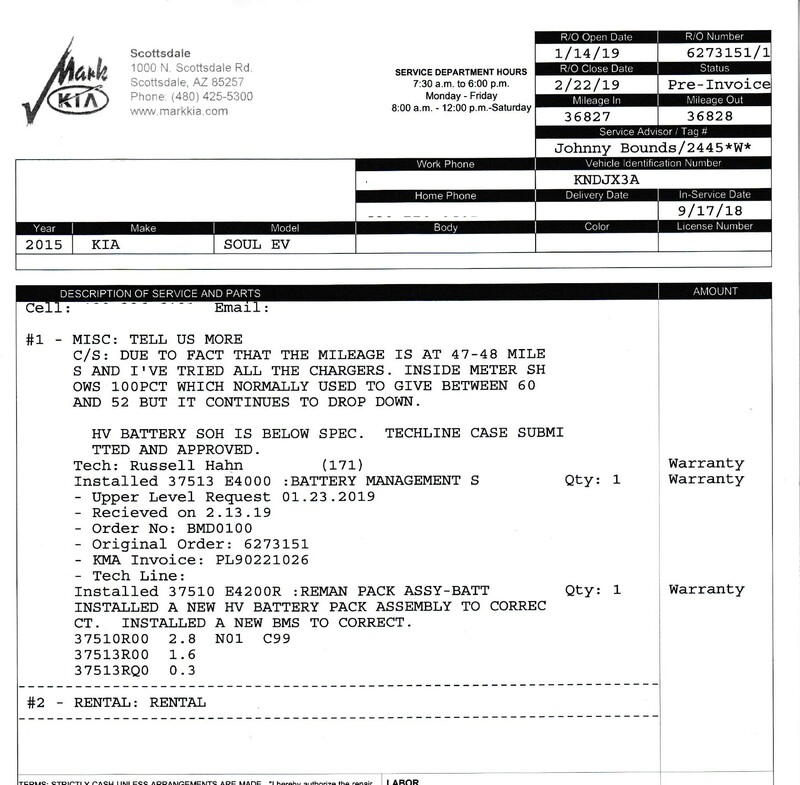 Mark Kia at least handles EV servicing rather than having to transport vehicle to Palm Springs, which was a huge factor in deciding to purchase a used "Compliance Car." Hoping things will be different with upcoming liquid cooled Niro EV & Soul EV. I'm up for a battery replacement now too. Started a new thread about it. Not clear how long it will take for the battery to arrive. Given that Kia is eating the cost of rental cars for many months while owners wait for replacement batteries to arrive, why in the heck wouldn't they just ship a bunch over in advance to save all that rental car loss? The end of my saga has arrived. 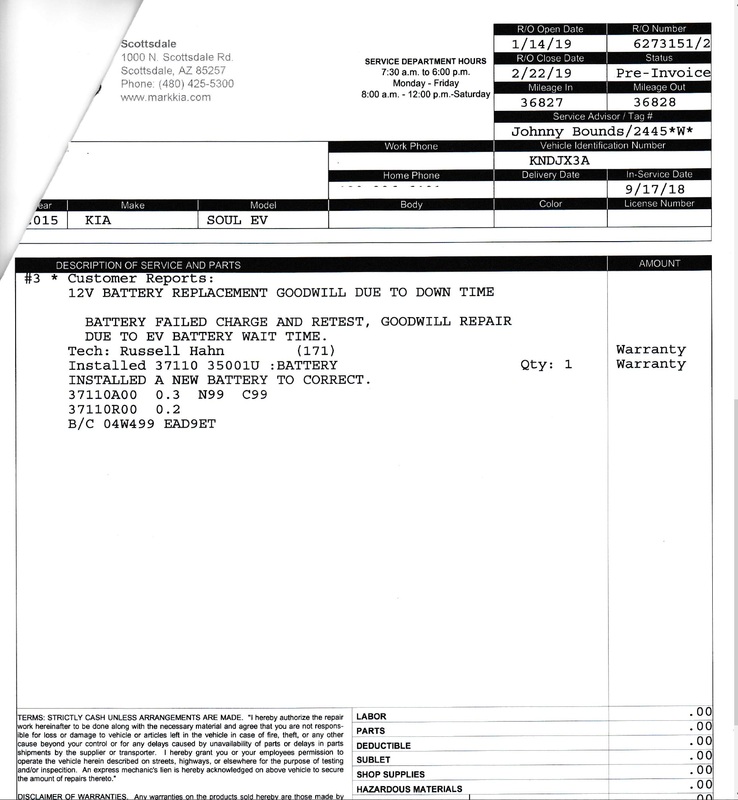 The battery replacement arrived, 6 months later, and the car was put back together. Since it was a lease, we decided to buy out the lease, IF, the residual value was negotiable since the residual value of the car was higher than KBB and NADA values. Both the dealer and KIA finance would not negotiate. And strangely I thought everything was negotiable. So they got their car back. Fyi, they gave us loaner cars straight off the dealer lot, not rentals. Our last loaner was a 2019 Sorrento. Good luck to all who have to have to have their battery replaced. Kish wrote: I doubt that anyone in AZ has theirs replaced within 30 days. Soul EV was never allowed to be sold in AZ right? So I'm willing to bet that AZ has lowest priority when new battery shipment comes in. CA probably has the highest priority. Has a 2018 Optima as free loaner. Mark Kia also replaced my 12Volt battery free of charge. Went in 1/14/2019 and got back with 2/22/2019 so not 30 days from when I took it in. However I only took it in because of the post saying batteries should be arriving on Jan 23rd. so considering I did get my vehicle back within Thirty days of Jan 23rd...I am guessing my replacement came from that shipment allotment. Kish wrote: Do you have any idea what the tested SoH % was (for 47-48 miles on GOM)? The paperwork didn't mention a specific number. Just curious. It had SoH% that showed up was 44%. Stating SoH was low enough to warrant repair. Vehicle had a Max of 67 miles when I bought it used in the fall, but the factory warranty is what swayed me to wards the Soul EV purchase rather than a 2017 Leaf. Currently getting 94 miles driven before the 25% indicator comes on. Driving in non-ECO D until battery shows below 85% and then switching to non-ECO B mode for some recovery. Hopefully the last time I will need another battery it will be near 2024, just before warranty will no longer cover battery.